I do like bagels. I think I had sandwiches for school lunch for too long, burnt out and didn't want to touch bread for years. I remember I had jam croissants for school lunches in infants for a time for this very reason! Had we the variety of bagels and pastries that we have now I'm sure I'd have opted for packed lunches well into my teens. This one however is a little more adult in it's taste sensation - red onion & chive. This is a flavour range that is much more suited to crisps ordinarily, but those are nice (and also popular - although not my first choice) and in theory this should work too. I took these to work to share. The postman had been particularly aggressive with our sample bag so they were mostly bagel fragments. 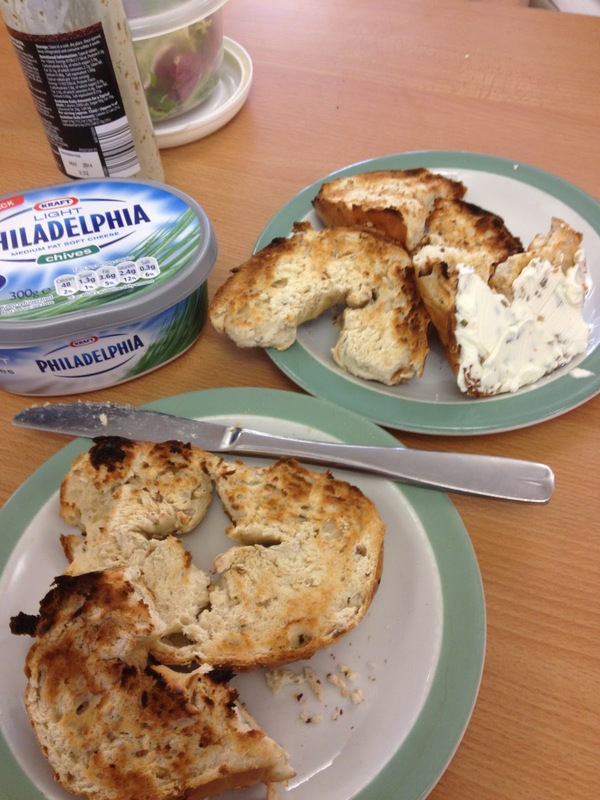 This lent itself to sharing quite well, although complicated the extraction from the toaster. My colleague had hers with light Philadelphia which happened to also be chive flavour, but she loved both parts and said that it wasn't overly chivey. I felt that the red onion did come through, but that the chive taste was most noticeable - especially after finishing. I didn't add any strong meats or spreads to mine (I've made the mistake of burying the original flavours before!) and think that it probably would be more suited to eating with something than solo. 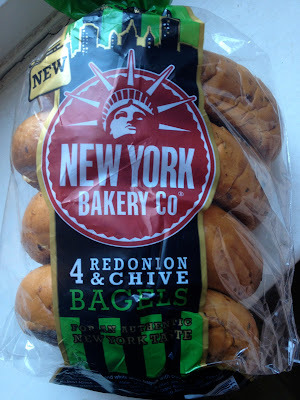 I did enjoy this, but mostly as they were high-quality bagels. 4 bagels did not last long with a hungry table of workers at lunch time, and I think these are certainly interesting enough to serve as the weather gets warmer for outdoor parties. I'm not sure chive is a lunch-time flavour, but my colleague strongly disagreed! I think that fans of strong cheeses will also find a good use for this - we may end up with more of these in our house for that very reason. I think I may hunt out the Blueberry variety that is a Sainsbury's exclusive as I am fond of sweet toasted things. Also there is a contest to become part of a bagel recipe book on their facebook page where you can get some other cool prizes. Worth a look. Feel free to vote for my entry - Peanut Butter & Choc Flakes - while you are there!